Oppo has posted an image of the smartphone on its website after teasing it on social media platforms. Oppo will soon launch a new smartphone in India and has started teasing the Oppo F9 Pro smartphone. The company recently tweeted out a new poster for the Oppo F9, hinting that the upcoming device will feature an unconventional notch design. This information comes not only from the teaser. Digging around the internet, we found that the company has revealed the device in an image on its official website ahead of the official launch. Oppo seems to be trying a new notch design that is smaller than the standard notch we see nowadays and it looks similar to the one we’ve seen on the Essential phone, but it’s shaped more like a teardrop. Going by the first official image of the smartphone, the F9 features a thin-bezel display with an almost triangular notch on top. However, as the notch’s outline and vertices are slightly curved, it looks more like a teardrop rather than a triangle. There is a single front-facing camera housed in the notch and above it is the slit for the earpiece. The side bezels are almost non-existent. 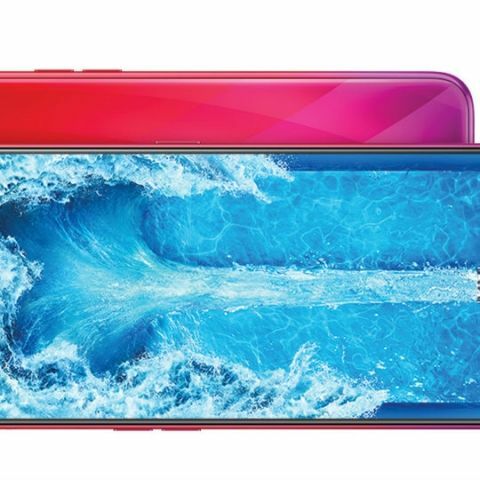 Even though there is a notch, the Oppo F9 Pro can be seen featuring a thick chin at the bottom. One can expect the fingerprint scanner to be located on the rear of the device. The volume rockers are placed on the left edge, while the power key is on the right. A cutout for the headphone jack can be seen at the bottom and as the image suggests, the F9 Pro supports the company’s proprietary VOOC Flash Charge tech. The smartphone is said to deliver two hours of talk time after just five minutes of charging, but we would like to test the claims ourselves after the phone is launched. Oppo usually equips its R series of smartphones with VOOC charging and it’s been a while since the technology was used on an F series handset as it was last used on the Oppo F3 Plus and the Oppo F1 Plus. The Oppo F9 Pro features horizontally placed dual cameras with an LED flash. The rear panel can be seen changing colour from red on top, to pink and violet towards the bottom. It’s not known whether the colour will change based on how the light is reflected from the rear panel or whether it’s a simple static colour pattern. However, when looking at the device from the front, the edges also show the same colour pattern and it seems like the company has used a simple static colour gradient design after all. It’s not yet known when the company will launch the smartphone or how much it will be priced at.